ideally this would be possible from the console interface as well, so that a number of pfind commands could be run inside a script - appending all the results to one file. file. Instead it shows the path to the temp file. Yeah, fixing this would also fix jamesbonds reported issue about Geany only shows 1 out of several similar hits (ie. index.html). If I use it then pfind 5.01 doesn't work. I had to use version 1.31 to make pfind work properly. Where did you find version 1.31 ??? 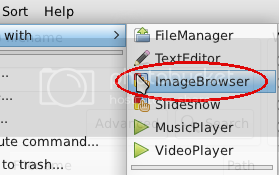 It is set to use the default image browser in the preferences. It is of course possible to define mtpaint, but that is not the intention. Where did you find version 1.31 ?? I found it on my USB stick. Did I download it?? Who knows. I see it listed on page 31. Please do NOT use the 1.31 test-version it was only meant for testing. I am the one to blame for the horrible choice of version-number. If there are bugs in the official pfilesearch-1.30, we have to track them. Please remove /root/.pfilesearch for a fresh start. Is it dpup exprimo spesific problem ? modified pfilesearch so that it doesn't search in system files properly.